There are those who will claim that “MICROSOFT IS STEALING FROM APPLE AGAIN JUST LIKE EVERY OTHER MANUFACTURER ALWAYS STEAL FROM APPLE!! !” but no, this is not the case. It was Microsoft who has really been striving over the past decade or so to try and make the tablet PC mainstream. They failed miserably but they did not steal the tablet from Apple. Now they are back again with a new design and surprisingly…new hardware. The main reason that Microsoft failed to succeed with tablets in the 2000’s is because they just took a desktop OS and slapped it on an underpowered poorly designed tablet pc that required the use of a stylus. 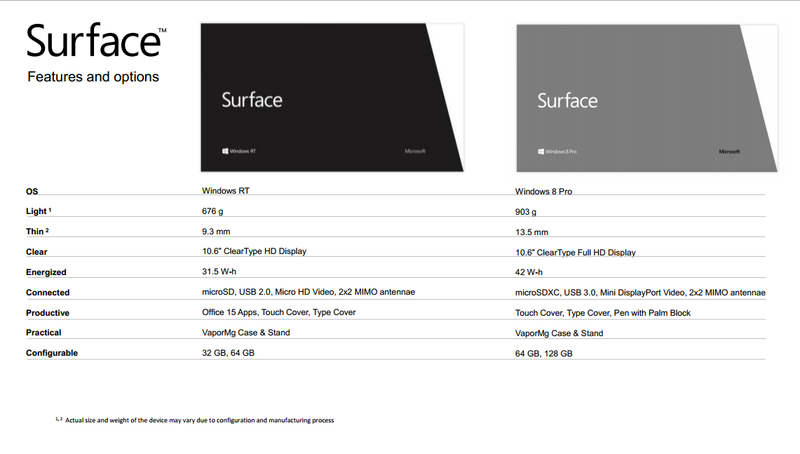 Microsoft really designed Windows 8 from the ground up with the intention of running on tablets. This may be what they need to differentiate and take the lead in the tablet market today. There are a number of business professionals who have held off adopting iPads and Androids for business because they simply were not powerful and feature rich enough for business applications. This is where Microsoft may have a winner. But time will tell if they have waited too late. Apple’s iPad already has a HUGE lead so Microsoft will be playing catch-up for the foreseeable future. Probably the coolest new feature of Microsoft’s Surface is the new cover/keyboard. Why didn’t Apple think of this? The built in kickstand and keyboard cover proves that Microsoft still has some innovation left in the company? What are your thoughts? Do you think Microsoft has a chance with this new device? Have they waited too late?